Bluesiam villa sits on a hill overlooking the prestigious Surin Beach, considered amongst the most spectacular beaches in Phuket. Providing excellent sea view, the villa is within walking distance of the beach, which is home to various beach clubs and other activities. The accommodation is less than 1 km from The Plaza Surin and a 19-minute walk from Bang Tao Temple. Catch Beach Club is 800 m away while Phuket International Airport is 24 km from the villa. Set within easy distance of Laem Sing, Bluesiam Villa offers accommodation with a fitness centre, free WiFi, a shared kitchen, and a shared lounge. One of the largest private villas in the area, it can comfortably accommodate up to 20+ people with all 11 bedrooms facing the ocean. A stay in the villa provides 100% view with 100% privacy, and at the same time, convenient access to the beach. Encompassing facilities such as home theatre, spa & massage rooms, fitness, private swimming pool, activity room etc., the villa has everything and more to ensure a pampered and indulgent holiday experience. A villa manager and his team is a service 24 hours to ensure guests’ well-being and provide the best comfort at all times. The eleven suite-style bedrooms make villa Bluesiam ideal for a special occasion with friends, a family reunion or even a tropical destination wedding. All the bedrooms are air-conditioned and have large glass walls overlooking stunning ocean views from the bed. Decorated in minimalistic style in white, the bedrooms are large and spacious and designed to make the best use of tropical living. Of the 11 bedrooms, nine are fitted with king beds, including four with jetted tubs, and two bedrooms with two twin beds each. Fold-away glass walls of villa Bluesiam open the terrace to the living room for one seamless indoor-outdoor living space. The open-concept living and dining areas are decorated in traditional Thai decor and contemporary style, and feature wicker sofas, graceful wooden chairs and modern artwork. The home theatre facing a comfy sitting area makes entertaining a breeze. A fully-equipped kitchen with a breakfast bar and a wine cellar extends into the dining area with a dining table that seats thirty. Outdoors, the terrace houses the swimming pool surrounded by plenty of loungers and sitting and dining areas. 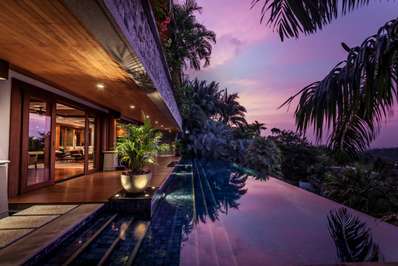 Located in Surin beach, Phuket. Villa Kanya is a in Thailand.